Stop Giving Away all of Your Money! 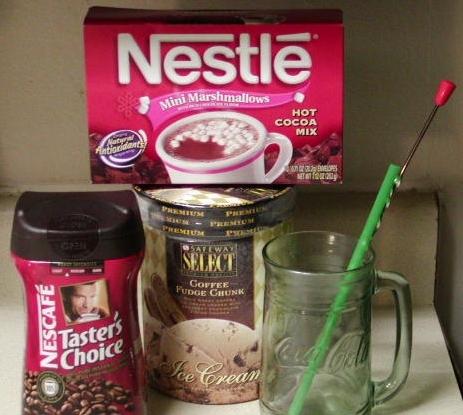 Learn to Make Your Own Mocha! A couple weeks ago, I walked into class with my usual Viente Javachip Frappacino with an extra shot, from our good friends whose company is named after a character on Battlestar Galactica. One of my classmates experienced something similar to technolust when she saw it, and said, "I sure wish I could drink those things all the time!" I asked her if she had ever heard of "The Cheap and Sleazy Mocha." She said she had not. I briefly explained to her what it was and how to make it, and she promised that she would try it. I saw her a couple days later, and she excitedly told me that she had been drinking those mochas down like there was no tomorrow ...! She thanked me for the recipe. About a week later, I noticed this very same woman, who had been struggling with her 80s the week before, had managed to pass not one, but *two* of her three 80s tests! 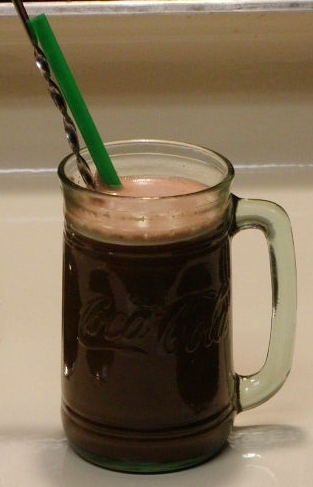 I must say that I do not know for sure if telling her about the newly rechristened Cheap and Sleazy Mocha was what did it ... but I thought, since she did pass two tests in quick succession after learning to make them, the least I could do was whip up something for all of you who read ol' Cheap and Sleazy! I dedicate this to that one student ... as well as my Canadian friend who told me no one loved her enough to give her chocolate on Valentine's Day --! Alana and Sugar, this one's for you. 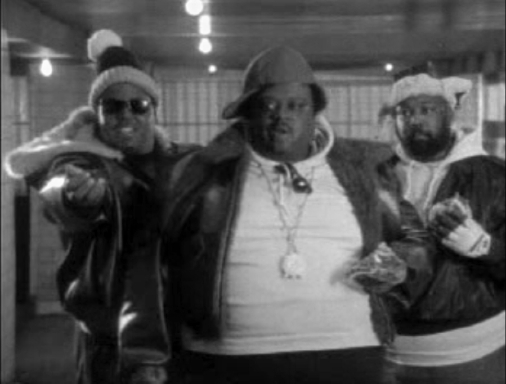 "Class ... class ... cla -- WAKE UP!!!!!!" "I gotta go to the can, man!" Where was I? Oh, yeah --! This article is for you! Of course, it goes without saying that you'll need a glass in which to mix them all (which, of course, explains why I didn't mention it before, right?). The fudge is a gift from a friend of mine -- who, incidentally, got me my first transcription job way back in 1999. I usually get these at Christmas time ... but every once in a while, she gets the urge to make up a batch ... and sometimes, she makes too much! That's when I get a phone call ... and free fudge! Can't beat that. 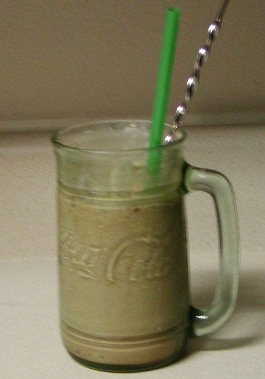 The glass is a Coke glass I picked up at a WalMart back in 2003 or thereabouts. They don't sell them anymore, but if you check second hand stores, you just might get lucky. I picked up three of them for $.50 each at a Goodwill once. Full, the glass holds 1.75 cups (fair warning ...!). to get to a little, tiny store in the middle of nowhere. They never had what you were looking for, and you paid full price once you got there, too." 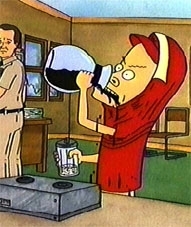 First, spoon out an appropriate amount of coffee into the glaass. I use two heaping teaspoons (maybe a bit more, depending on how little sleep I got the night before). Next, pour in one of those packets of instant chocolate. Next, add in a hunk of fudge. Alas, I can't guide you here; it's a ... gut thing, gained from many years of practice and taste testing! A good rule of thumb would be to make your hunk of fudge about the size of an average ice cube. If you're a microwavin' type of person, fill up the glass appropriately and nuke, as necessary. If you leave your Cheap and Sleazy Mocha in the microwave unattended for too long, you are guaranteed to have a mess to clean up! Stay nearby. If you're the old-fashioned, "bubble, bubble, toil and trouble" type, before you pour that boiling hot water into a glass, put a metal spoon in it, and ensure the water hits some part of that spoon as you're pouring it in (pouring slowly is best, by the way). To avoid having to clean up a mess! If you don't let the spoon act as a heat sink for that boiling water, the glass itself will do the job, and it will most likely crack in the process ... leaving you with a hot, chocolatey, gooey mess to clean up. Do you have an empty Snapple bottle or something similar? If so, instead of placing all those ingredients into a glass, place them all (less the water) into the Snapple bottle. Put the lid on, and take it with you. Once you get to ... well, wherever you're going, add the water, and put it in the microwave, and have at it. I should point out that I have not done this exactly; I used to put everything into a plastic jar, then transfer everything to an appropriately sized glass once I got to school ... but that was back in my Electronics Technician School days -- about which, the less said, the better. Those of you who are awake because you made one of the afore-mentioned Cheap and Sleazy Mochas probably noticed the difference in the picture. Those of you who did not, I'll tell you what the difference is: The ice cream. Or more specifically, the Coffee Fudge Chunk ice cream --! Coffee Fudge Chunk, yo! Coffee Fudge Chunk! You'll need a blender for this one ... but that's optional, I suppose. You will need the same ingredients as in the original recipe. However, there is a bit of difference in the preparation. 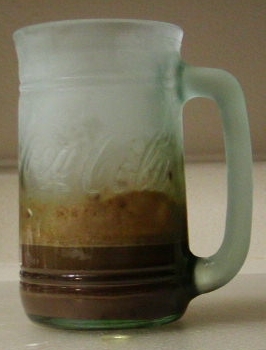 Instead of filling the glass completely with water as in the original recipe, use 1/4 cup of milk to cover the coffee, fudge, and chocolate. Those of you who don't do milk, feel free to stick to water (or your favorite milk substitute, if you wish) ... but I like milk better for this. If you happen to be using a Coke glass like the one shown, the bottom of the ring in the glass (more visible in the next shot) is roughly a quarter of a cup. I use that as my measuring cup ... and in the summer, when I show you how to make a Cheap and Sleazy Peach Iced Tea, you'll see how important that is! 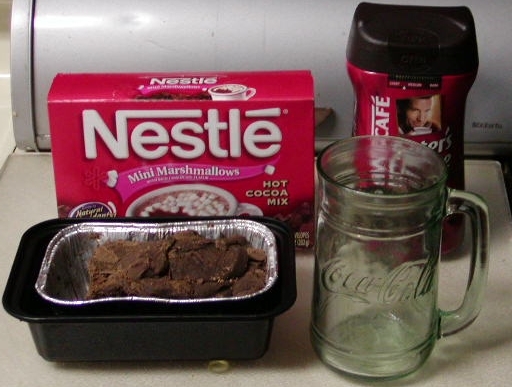 If you're using a microwave, nuke those ingredients long enough to melt the fudge. Take the glass out of the microwave, and stir the mixture with a spoon (or, if you wish, a wire whisk). Now the hard part: Let it sit to cool. Those of you in a hurry, feel free to put it in the freezer for about 15 minutes or so -- as long as it's cold before this next step. Time's up! Take that glass -- and the ice cream -- out of the freezer. Add a couple scoops of ice cream to the mix. 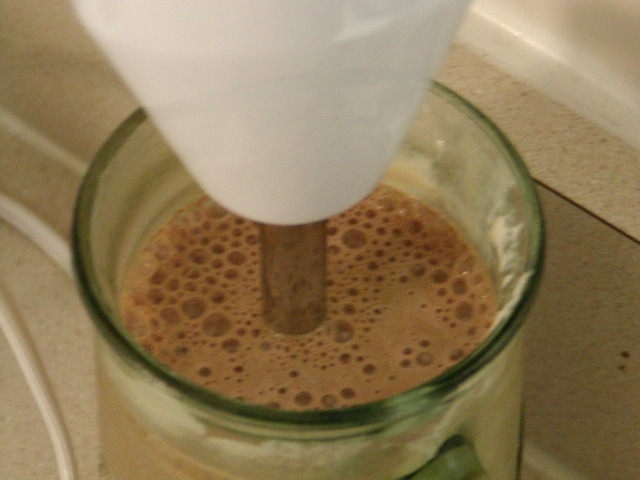 If you have one of those "in-glass hand mixers" (the box might say "immersion blender"), plug it in, and start mixing! Still ... it tasted pretty good ...! A Little Restraint, Please ...! What, you're still here? Go make one! You can read about that unfortunate issue in this update. I am happy to report that I FINALLY managed to find a suitable replacement -- a mere four years later. That's right ... 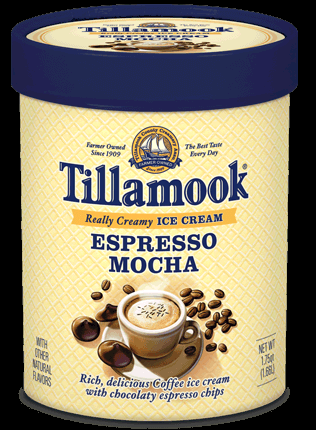 I'm talking about Tillamook Espresso Mocha ice cream! As you might guess, it's taken me quite a while to find this new substitute, but it was worth the wait! Unfortunately, I don't know if this brand of ice cream is available in every state (they're based in Oregon). As an aside, my father had been singing the praises of this brand of ice cream to myself, my sister, and anyone who happened to be within earshot for years ... but at the time, they were selling for something like $7.50 a quart, and I wasn't going to spend that much on ice cream. They've since come down quite a bit on the price, and with the release of their Espresso Mocha flavor, I found I had no excuse not to try it. Glad I did! Thanks, Dad! This article is (also) dedicated to my friend Sugar's boss, Max. Max was attacked by four "men" this past weekend, who decided to voice their views on gay rights by beating up the first gay man they saw. Max hasn't awakened since the attack (25FFEB06); his jaw is broken, his back is broken, and he's had surgery twice in a two-day period ... and for what? Absolutely no reason at all. A few months ago, I asked my friend Sugar how Max was doing. She said he was awake and healing, but he doesn't remember anything about what happened to him that night. He no longer lives in the area where the incident occured, as his mother took him home to take care of him. Not sure how the healing is going; hopefully Sugar will get back to me.